Few with any legitimate appreciation of the craft of television and its importance to us will question the greatness of Lost as a series. Although it added complexities as the years piled on, including a dangerous game of nuclear brinksmanship, it ultimately dealt with the clash between a Man of Science (Shephard) and a Man of Faith (John Locke). The important message it taught us was that these positions might seem intractable, but, despite what message board prognosticators would tell us, they were—and are—never dichotomous. What we saw at its conclusion, in fact, was that true progress, true spiritual union, the true possibility for any diverse society to move forward, required the two notions to become reconciled to one another. We have already seen what a society morally bound only by science can do to nations, and it was a new dark age brought by those "lights of perverted science"—ones which Churchill tried to warn the world of, before the great and enduring calamity that befell the Jewish people. Similarly, we need only look today to the specter of Islamic fundamentalism to see how ill a society is served when its instruction comes only from faith. The pursuit of knowledge must be tempered by the moral injunctions of religion, but the value of leaping in faith can only be found in looking first from reason. This much Lost has to tell us. Yet of the two dramas ending this week, Lost will perhaps have the lesser traction intellectually, at least for now. For yesterday at 4:30 a.m., in the Mediterranean Sea, we saw the end of the complex fiction that the citizens of Gaza are Israel's victims, and that the international community are mere saints of rescue. Though it is certain that the wags and naïfs of the pundit class will dismiss this as Israel stopping the spread of "Weapons of Mass Nutrition," it is doubly certain that those who are essentially unserious about staunching the flow of Islamofascism were dealt the most serious blow on that flotilla just outside Israeli waters. What would have happened if an unchecked flotilla boat committed a terrorist attack akin to the bombing of the U.S.S. Cole? Worse, what if the "humanitarian" aid were unloaded without checking, and the explosive materials that could have made another U.S.S. Cole were exploded outside schools and synagogues, in buses and cafés, amid crowds at concerts or narrow streets? From the armchairs of Israel's English and American critics, it's enough to celebrate Gaza obtaining tons of concrete; there is no need for asking what it could do to IDF bulldozers if put through processes that rendered it structurally able to form homes or hospitals capable of healing or growing Islamic fundamentalists. Those who would exculpate the "activists" on the flotilla from any wrongdoing—despite the fact that they attacked Israeli commandos first and that they, unlike the IDF, had no commitment to minimizing casualties—have no answers to these questions. They are either committed to Israel's destruction, or they are committed to the island of hope that is Israel without any appreciation of the sacrifices of defending it. They do not realize that even the wine-dark Mediterranean must be stoppered up, lest an evil that can consume middle east democracy from within be allowed to seep through Israel's vigilant stewardship of liberty amid the arab world. Instead, they engage in the mass production of more blood libels. As wicked a fable as the Wandering Jew, the Protocols or Deir Yassin, they now spin a yarn about Israeli piracy and bloody foredecks, about indiscriminate killing instead of restrained police action. This yarn extenuates from a worse one, about a program of starving Gaza and famine-based genocide, a deliberate misinterpretation of a reasonable national-security program of putting the Palestinians on a diet, to make the hunger pangs encourage them to force Hamas out. Yet this program was never intended to lead to starvation but only rehabilitation. It's as if they see Sawyer locked in a bear cage without once acknowledging the fish biscuits. Meanwhile, those who would defend Israel do so from knowing the social science of history and the responsibility of public policy—but also from the certitude of faith. 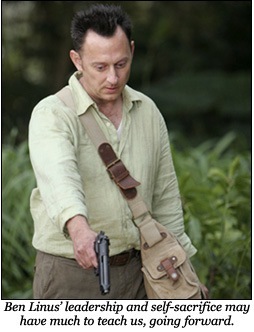 Perhaps the most moving story of Lost is that of Benjamin Linus, who sacrificed his own daughter to preserve the island and employed diplomacy, deceit and unwavering force to carry out his charge. Though initially perceived as the show's greatest villain, his faith in a special place led the show's avatar of G-d himself to name him his right-hand man. In the end, when others have moved on, it is Benjamin who remains outside, confident that his work is not done. I think it no small coincidence that he shares his first name with Israel's current prime minister. 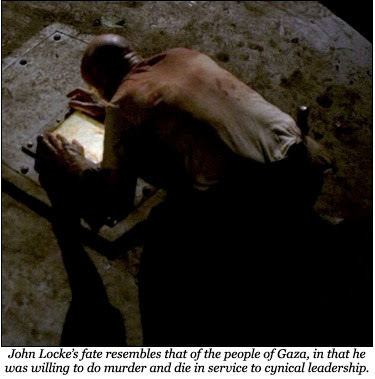 In the end, those who speak of destiny and faith without first tempering them with reason are doomed to promote only an atavistic society that cannot restore stability to the middle east and instead offer it—as John Locke did—only a cult of death. Meanwhile, those who emptily attempt to ratiocinate a peace through dispassion and without conviction prescribe solutions that work only in theory and never on the soul. They are the Jack Shephards who lack the faith to shepherd any flock, let alone many. Their end lacks the spiritual commitment to move forward to a new era. They lie down with a dog, but don't wind up in light. They wind up with fleas.